Summer cocktailing calls for lighter libations. It’s nothing worse than drinking a harvest-worthy drink in the heat and humidity. I tend to stick with a crisp white wine or glass of champagne during the warmer months; but for a mixed cocktail, I love a Mojito. The Mojito is a traditional Cuban highball consisting of white rum, sugar (traditionally sugar cane juice), lime juice, sparkling water, and mint. Havana is the birthplace of the Mojito, although the exact origin is a matter of debate. The original Cuban recipe uses spearmint or yerba buena, a mint variety very popular on the island. I tried to find an English translation of the word Mojito, but could only find one. “The name mojito stems from the African word of “mojo ” which means to place a little spell.” I like it! 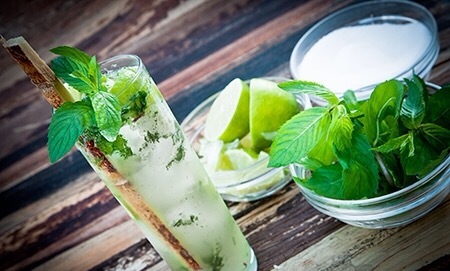 The Mixology | Muddle one sprig of mint with lime and syrup. (I love the traditional wooden muddler). Add rum, bitters and ice and shake. Strain into an ice-filled high ball glass and top with soda water. You must not forget to garnish with sugar cane. Salud!